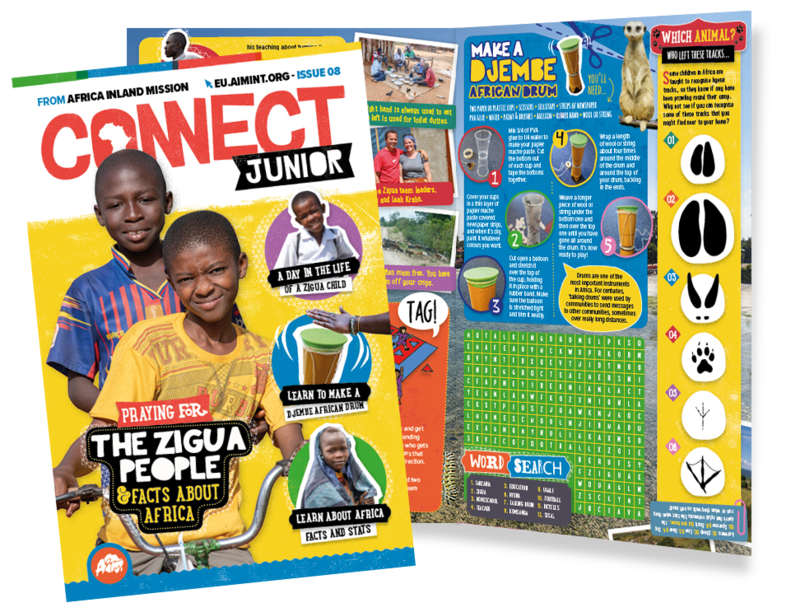 Connect Junior is Africa Inland Mission’s new quarterly magazine for children. 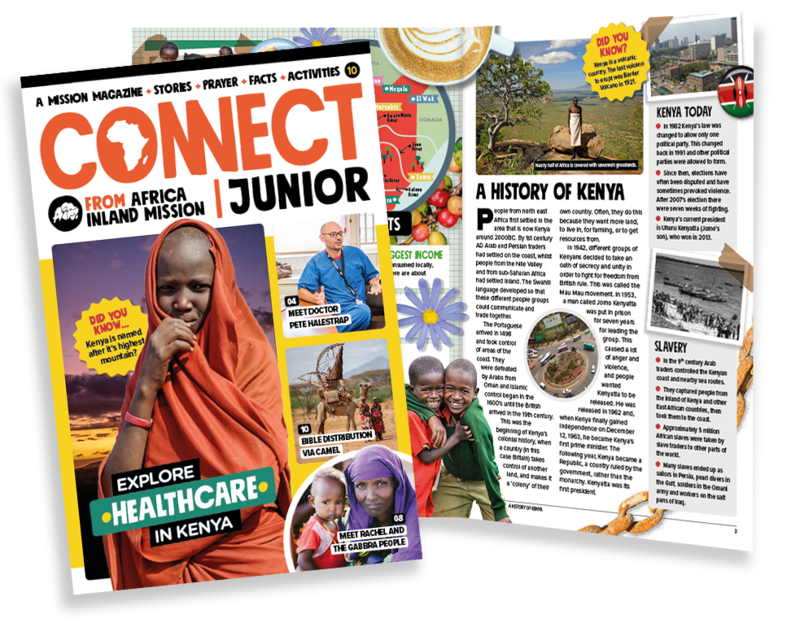 It includes stories, facts, activities and information to help you pray for Africa’s people and those who go and proclaim the good news of Jesus Christ. 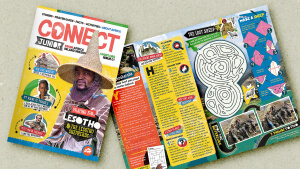 Each issue can also be used alongside one week of the adult version of Connect, so you can also use it together as a family. 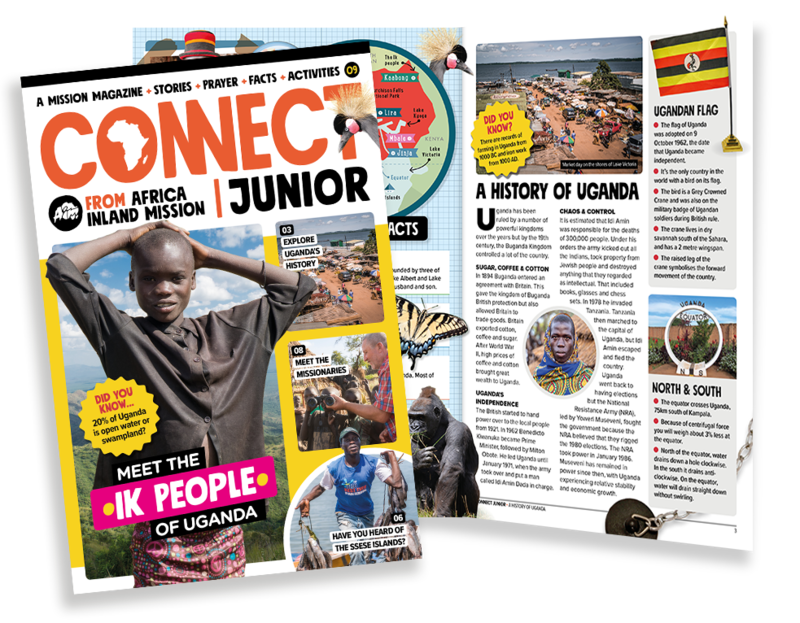 Sign up for Connect Junior and you’ll also receive this map of Africa, including illustrations, facts and flags on each of the countries. 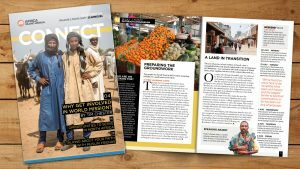 There is also a prayer focus on ten of Africa’s people groups, where many still haven’t heard about Jesus. Kenya is a diverse country. There are many different landscapes like mountains, savannah, lakes, forests and deserts. Lots of people live in big cities too, like Nairobi, the capital city. But some people live in very remote places, where it can be hard to access water, food, medicine and healthcare. Often, the people living in these areas have never heard about Jesus before either. 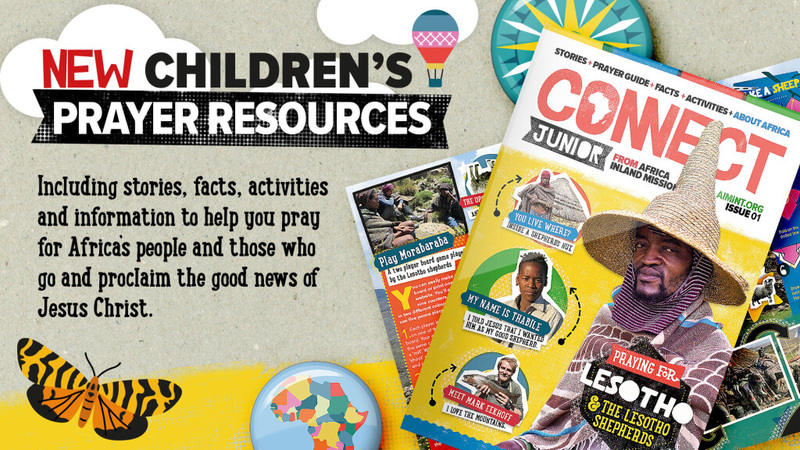 Accompanying resources for issue ten. The Ik are a people group who live on a small mountain ridge in north east Uganda. Just north of them is the Kidepo National Park and in the south, the Timu Forest. Because of their location, and only numbering 7,000-11,000, life can be hard. There is poor healthcare, extremely low educational levels and a massive problem with alcohol. Accompanying resources for issue nine. T he Zigua live in a small coastal region in northeastern Tanzania. Those who live inland grown sisal, sesame and corn to make a living, and those who live near the sea are fishermen. Many of the Zigua living rural villages don’t have any electricity, and build their houses out of mud and grass. Zigua kids are very creative. They all make their own toys. Some of them even make wooden bicycles! Most Zigua boys love football so much that they scratch a pitch in the dirt in front of their houses and make footballs out of old plastic bags and rags. Accompanying resources for issue eight. Followers of Islam are called Muslims. They believe there is one God, who is called Allah. The Muslim holy book is called the Qur’an. Muslims follow the five Pillars of Islam, which are an essential part of Muslim life. They worship in a building called a Mosque, and on Friday at noon, the most important of the weekly services is held. 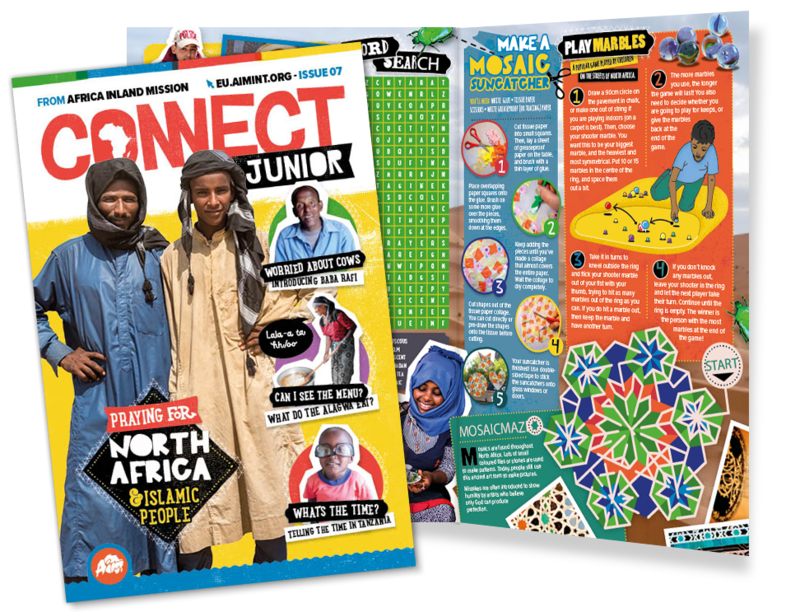 Find accompanying resources for Connect Junior issue seven, featuring North Africa and Islamic people. Accompanying resources for issue seven. The Digo live in East Africa. Their villages are on the south coast of Kenya between a city called Mombasa and the border with Tanzania. As well as farming and fishing they trade goods with neighbouring people groups. They also grow sesame, corn, rice, and beans. 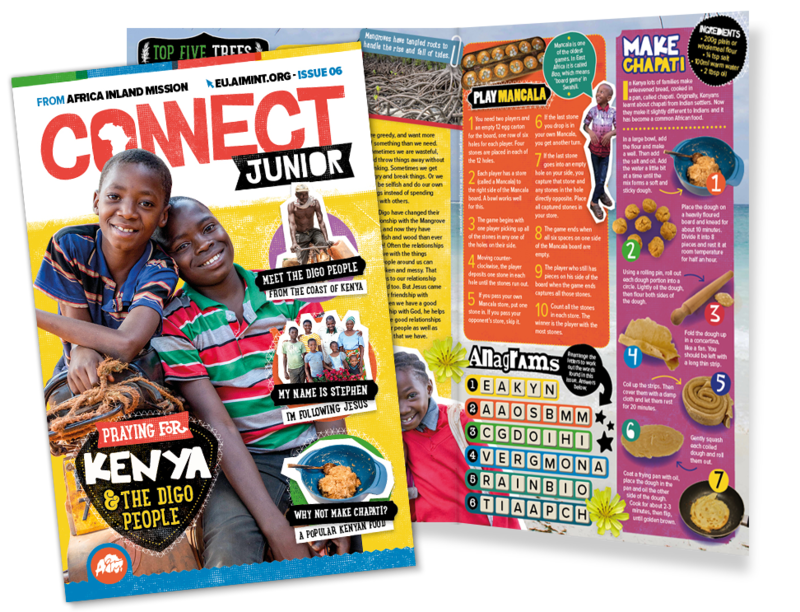 Find accompanying resources for Connect Junior issue six, featuring Kenya and the Digo people. Accompanying resources for issue six. 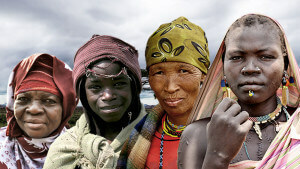 The Alagwa are a small people group living in 15 villages in central Tanzania. The Alagwa farm crops and look after animals. The Alagwa speak Alagwaisa. 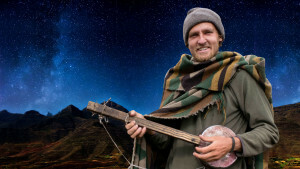 It’s one of 127 languages spoken in Tanzania – although two languages recently became extinct! 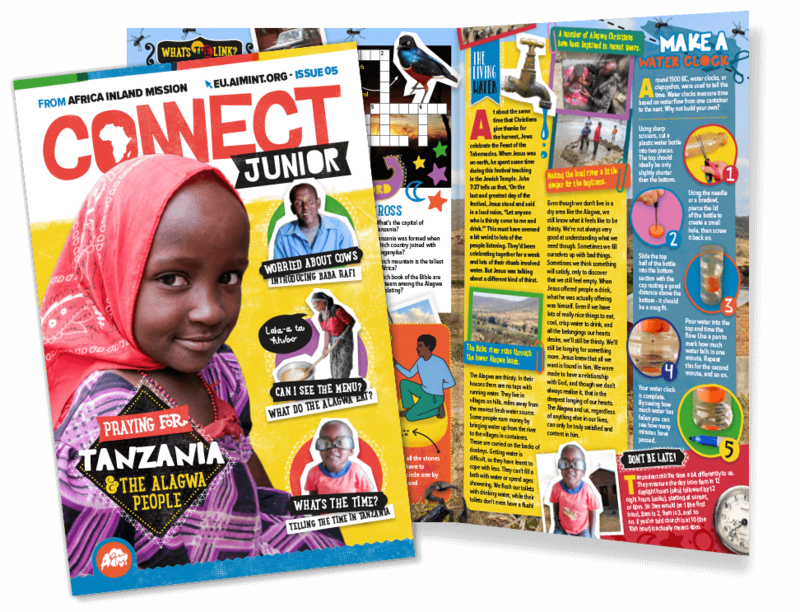 Find accompanying resources for Connect Junior issue five, featuring Tanzania and the Alagwa people. Accompanying resources for issue five. The Mwani live along the coast of northern Mozambique. Influenced by sea-faring Arab merchants centuries ago, their culture is defined through fishing and folk Islam. 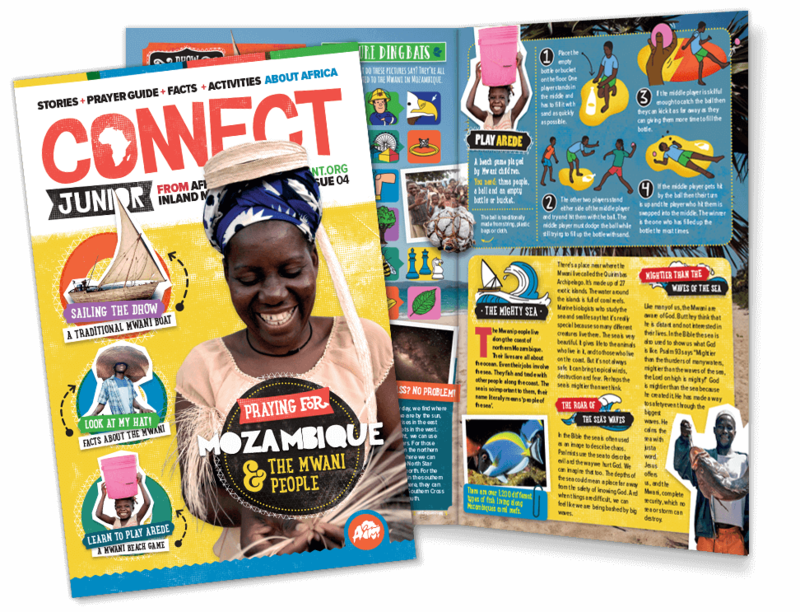 Find accompanying resources for Connect Junior issue four, featuring Mozambique and the Mwani people. Accompanying resources for issue four. The Laarim live in the south east corner of South Sudan in small villages in a place called the Boya Hills. Their life revolves around cows. They breed cows, eat their meat, drink their blood and milk, and sleep on their hides. 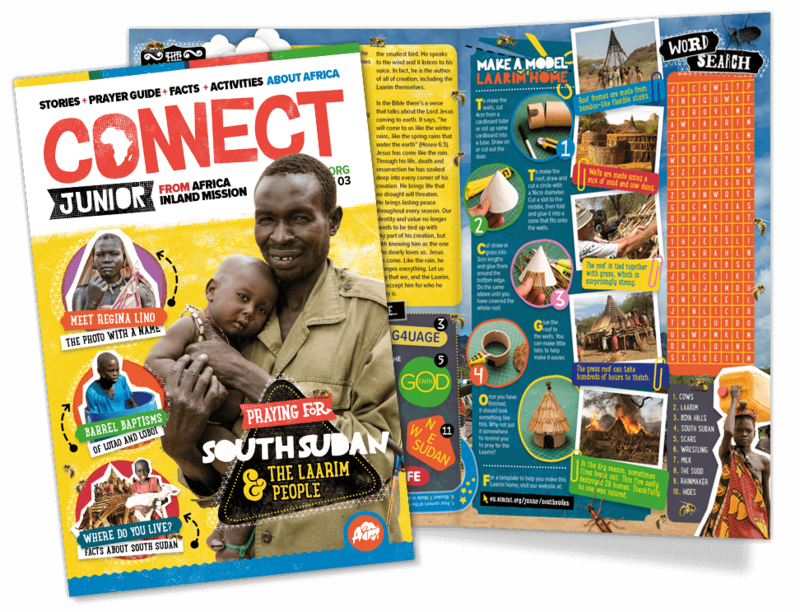 Find accompanying resources for Connect Junior issue three, featuring South Sudan and the Laarim people. Accompanying resources for issue three. Madagascar is home to a whole lot of plants and animals found nowhere else on Earth. In fact 90% of all the plants and animals there are only found in Madagascar. 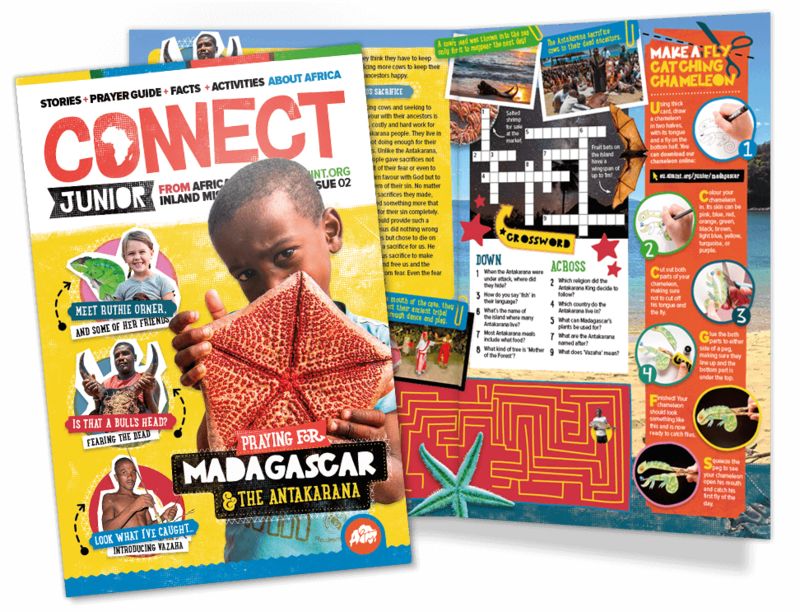 Find accompanying resources for Connect Junior issue two, featuring Madagascar and the Antakarana people. Accompanying resources for issue two. 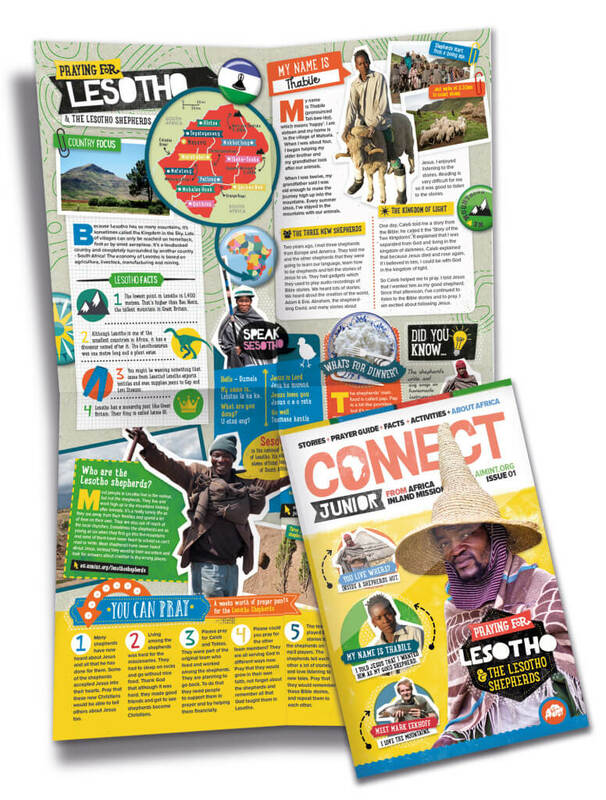 Most people in Lesotho live in the valleys, but not the shepherds. They live and work high up in the mountains looking after animals. It’s a really lonely life as they are away from their families and spend a lot of time on their own. 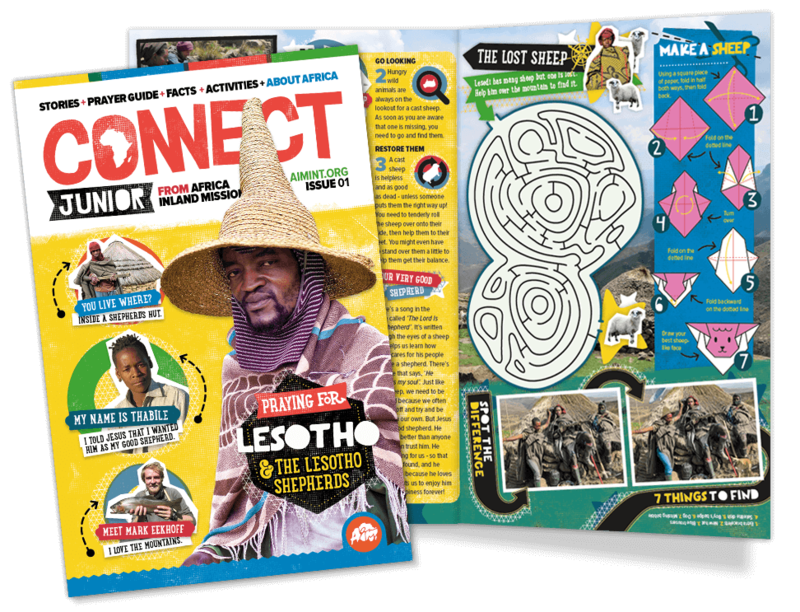 Find accompanying resources for Connect Junior issue one, featuring Lesotho and the Lesotho Shepherds. Accompanying resources for issue one. Please leave these two fields blank if you are signing up for yourself. 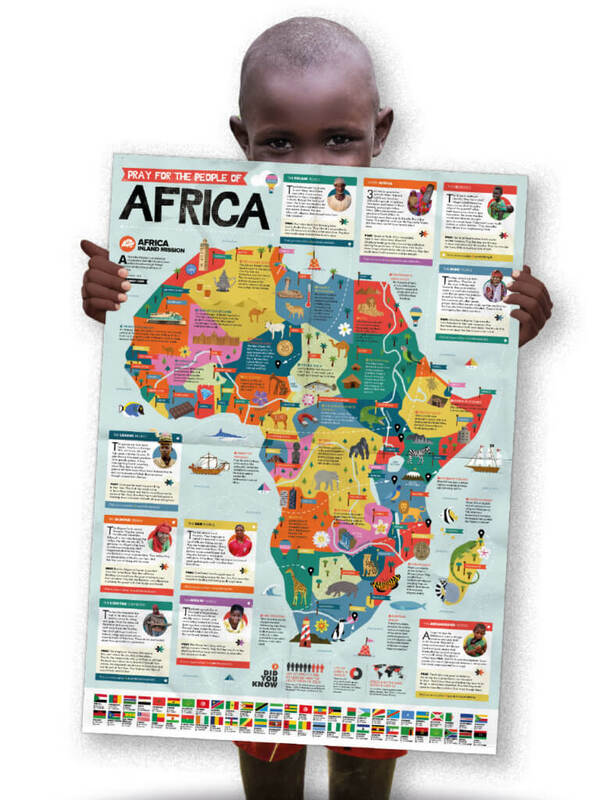 I give parental/guardian consent that AIM can send us prayer material about Africa and the work of AIM. Please can you also send me Connect for grown ups?